If you love birds, the following are great ways to participate in citizen science while having lots of fun at the same time. The 2015 Great Backyard Bird Count will take place Friday, February 13, through Monday, February 16. This annual 4-day event engages bird watchers of all ages in counting birds to create a real-time snapshot of where the birds are. Please join us for the 18th annual count! 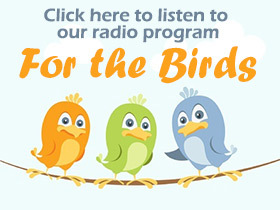 Everyone is welcome to participate — from beginning bird watchers to experts. It takes as little as 15 minutes on one day, or you can count for as long as you like each day of the event. It’s free, fun, and easy — and it helps the birds. New participants must set up a free GBBC account to submit their checklists or use login information from an existing account for any other Cornell Lab citizen-science project. You’ll only need to do this once to participate in all future GBBC events. See How to Participate for more details. As the count progresses, anyone with Internet access can explore what is being reported. For more details, as well as tools and how-to’s, please visit the official site for the Great Backyard Bird Count. The 2015 Pennsylvania Migration Count will be held on Saturday, May 9, 2015. The Pennsylvania Migration Count takes place each spring on the second Saturday in May, in conjunction with International Migratory Bird Day. PAMC is similar to the Christmas Bird Count (CBC). The difference is that PAMC takes place on a countywide basis, rather than within the confines of a CBC circle. The rules are simple: spend some time in the field counting all birds encountered in a specified area, and keep track of miles traveled and time spent counting. Participants are free to roam their favorite county birding locales at any time during the 24 hour period, starting at 12:01am, counting every bird that they find. Totals are passed along to county compilers, who, in turn, report to the state compiler. The state compiler maintains the PAMC data, and an annual report is published in Pennsylvania Birds, the journal of the Pennsylvania Society for Ornithology (PSO). The Pennsylvania Migration Count originated as part of the continent-wide North American Migration Count (NAMC) in 1992, when there were 141 observers in 10 Pennsylvania counties. The count grew steadily in popularity in PA over the years, and was renamed PAMC in 2003, reflective of the fact that the national count was struggling everywhere but in Pennsylvania. Last year 903 observers from 53 counties participated in the PAMC. They counted 199,120 birds of 238 different species in over 2932 field hours. This year there are already more counties committed while we are always looking for more people to help. This year has us up to 59 counties committed out of the 67 in the state. Volunteers are needed to help cover Wayne County. Birders of all skill levels can help out with the count. Beginning at midnight with the songs of the Whip-poor-wills and the hooting of the Great Horned Owls, the PAMC is a great way to spend time outside. Whether you tally birds in your backyard, at your feeders, the local little league ballfield, along the river, on a lake, at your camp or spend time hiking through a state park, your observations count. While observations can be made over a 24-hour period, it’s up to you to decide how much time you will contribute. If you are interested in participating, please contact Chris Fischer at cfischer17@gmail.com for more information and to avoid duplicate submissions from the same area. Forms and information for PAMC participation are also available online at http://www.pabirds.org/PAMC/Index.html. Data can be submitted via e-mail or post. For more information, please visit the Project FeederWatch website. Help Us Count! For over 114 years, Audubon’s Christmas Bird Count has been a time-honored tradition. Citizen Science data collected during the CBC have uncovered critical information for bird conservation. The Christmas Bird Count takes place annually in December. This year it will be held on Sat., Dec. 20, 2014. The longest running Citizen Science survey in the world, the Christmas Bird Count provides critical data to scientists who study long-term trends in bird populations. Participate and learn how we conduct this local bird count within a 7.5-mile radius of White Mills, PA.
It’s free to participate! For information, please call Barbara at 570-253-2364. For more details, please see the official Christmas Bird Count page on the National Audubon website.